Sometimes it’s hard to imagine Manhattan – a mess of concrete, skyscrapers, and underground tunnels where more than 4 million people call home – was once an open stretch of farmland and vast rolling hills. It’s striking not just because the city is a remarkable feat of engineering but because somehow, in a way that still baffles me, most of these four million people eat. I cannot yet grasp how food makes it through the labyrinth of Manhattan to every neighborhood market and corner Bodega (I’m told it has something to do with Hunts Point) but somehow it does, and four million people subsist, without a farm in sight. I spoke to one vendor at a farmer’s market (in NYC called a greenmarket and run by growNYC) who told me that actually, in many cities (especially NYC) there is an absolute dearth of fresh produce, which is why green markets are popping up all over the place. It takes so long for food to be processed and distributed throughout the city that some people are skeptical of fruits and veggies that actually make it to the supermarket shelf without imploding or combusting—or at least sporting suspicious looking brown squishy spots. However there maybe be another, potentially more efficient, and very exciting alternative to the greenmarket, according Bob Walters, director of the Science Barge in Yonkers, NY. Maybe it’s possible this land could again be considered farm land, after a fashion. These days efficiency is everything. Just about every valuable natural resource we have on Earth is dwindling. Many people have begun to realize the only way humans will survive is by choosing more efficient, sustainable lifestyles. Happily, while other resources peter out, there is still a wealth of creative minds working to realize the possibilities of sustainable living. The Science Barge represents one such sustainable alternative (and will absolutely blow your mind with its innovation). According the director, the project is designed to be a prototype of sustainable urban farming. And man, oh, man, is it efficient. 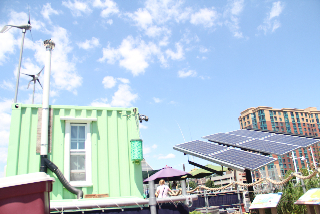 The barge is completely off the grid, relying on solar panels (they have 12 solar modules that can produce about 2,500 watts/hour), wind turbines (on the barge there are five marine grade wind turbines that generate 2,000 watts per hour), and a biodiesel generator to meet all of their energy needs. Most of the barge itself is made from galvanized steel, which is a recyclable material, that has been in use for various projects for over 50 years. The other construction materials used to build the boat were purchased from Build it Green Queens, an organization that sells materials scrapped from demolition projects. Sound efficient yet? Read on. The picnic table and ramp on the boat that the barge staff use when school children come on field-trips to the barge are made entirely from 80% post consumer recycled plastic. Most of the barge’s water needs are met by the water collected in the rainwater storage units onboard (one inch or rain in these babies provides 800 gallons of usable water). In order to avoid polluting any water with harmful chemicals, the farmers do not use any pesticides. And, yes, it’s on a boat. I was particularly fascinated by the barge’s efficient use of water. 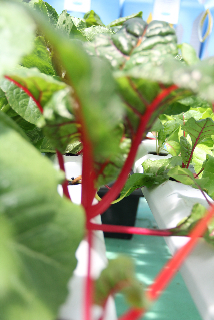 They do this by using hydroponics, a system that, according to Science Barge employee Jamie, uses only 25% of the water used by traditional agriculture. Jamie went on to note that 60% of the world’s fresh water is used to grow crops. Often, the pesticides, fertilizers, and other chemicals used on traditional farms pollute nearby bodies of water when run-off from the fields enters rivers and streams. Yikes. Hydroponics works by replacing the soil traditionally used to grow plants with nutrient rich water. The system minimizes evaporation and, when done correctly, makes is very efficient. 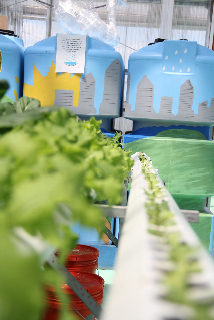 In addition to hydroponics, the Science Barge is also experimenting with aquaponics, a rainwater catchment system, and a reverse osmosis system. They may conserve water, but these folks are definitely letting the creative juices flow. Though the Science Barge is working marvelously on a boat, Bob, Jamie, and the other folks at the Science Barge envision a city in which both boat farms and rooftop gardens using hydroponics and other efficient systems provide vegetables for the millions of folks living in working in the city. This entry was posted in Food Warrior Interns, On the Farm and tagged food warrior intern, hydroponics, Real Time Farms, science barge, Yona T. Roberts Golding. Bookmark the permalink.